With a change in seasons comes a change in our play space set up. 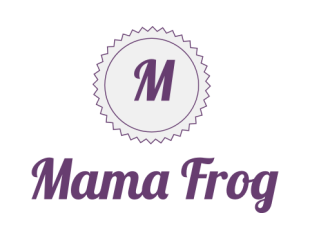 Now froggy can crawl and sit up independently the name of the game is less is more. 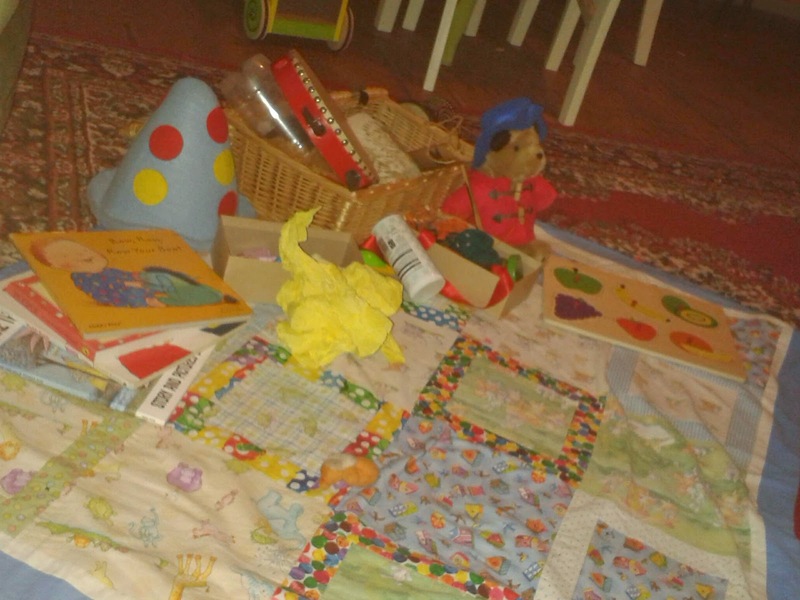 I've curated his toys down to three small boxes on his quilt in the living room floor. This helps prevent anything going missing (update gnomey has now been found safe and well ) and makes it possible to present all in an easy to access format to encourage independent play. 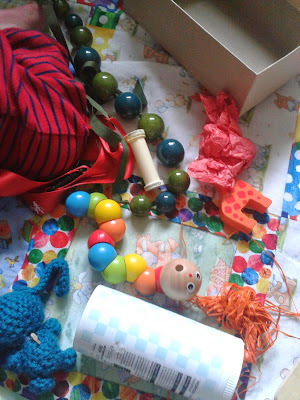 As you can see its a small amount of stuff. I tend to switch it around as much as possible to keep the baby on the mat and out of trouble. So what keeps the curious half yearling happy? There's a few "real toys" we keep one bear, frog enjoys holding him and chomping his paws. The other wood toys are pretty simple. There's a handful of Farm animals and a wooden peg puzzle of fruit. These reinforce regular concepts into our day to day vocabulary. These are mixed in the small boxes with a mix of heuristic bits. 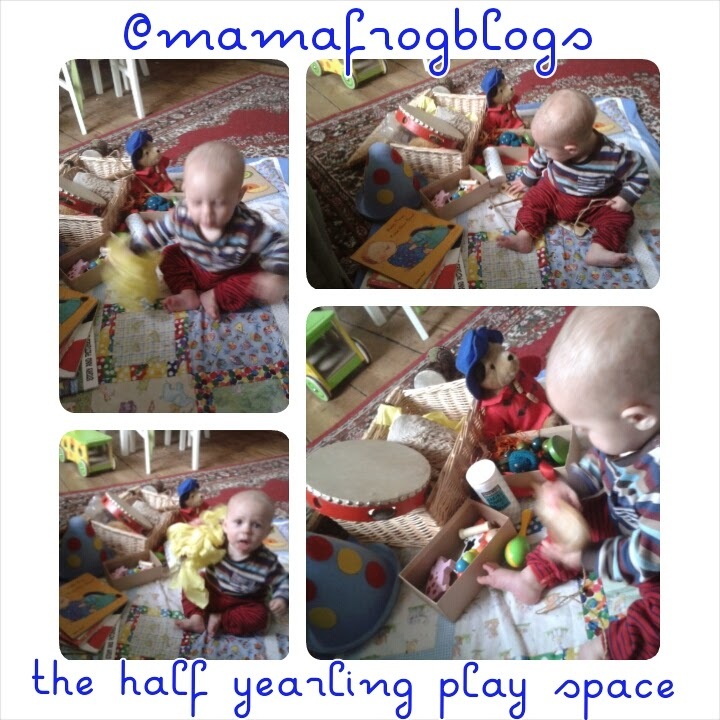 I write about heuristic play a fair amount so check out the tab for more ideas. At the moment froggy has raffia a crochet rabbit, ribbon, a cotton spool, tissue paper, lanyard and plasic container. 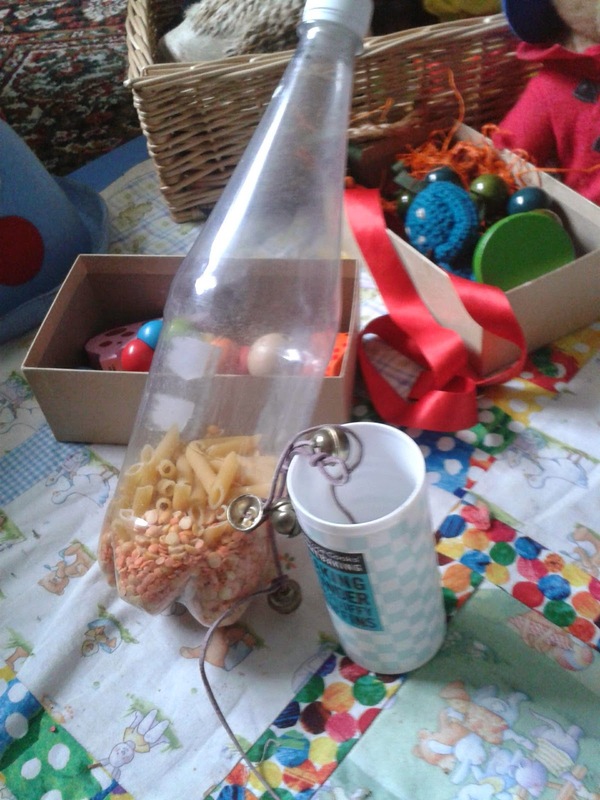 Still featuring in the play space and still very popular with froggy is his music basket filled with his hand percussion instruments and some homemade extras- a pasta and split pea rainmaker, and a threaded jingle bells.